For the past 12 years I have had the honor to be your President and have relished that honor every day of the entire term in office. Now has come the time to step down and pass the reins over to another deserving RSA member. This does not mean I will not continue to be a part of the Society activities, it only means my participation will be one of support rather than guidance. many, many hours and many, many personal dollars to make your Society what it is today. They have responded when called upon and stepped forward when there was work to be done or responsibilities to be met. These worthy fellows are not listed in any particular order, as each did his/her share and shouldered responsibilities when called upon. On second thought, there is one who went the distance and then some. provide the necessary action before it could be called to his attention. Roy Marcot, the Editor of the Remington Society Journal, has contributed countless hours to producing the very best arms collector’s magazine in the entire country. He has assembled the various articles, advertisements, columns and editorials required to make up each issue of the magazine. He has stepped forward to assist in the RSA Annual Seminars and Exhibits across the country. 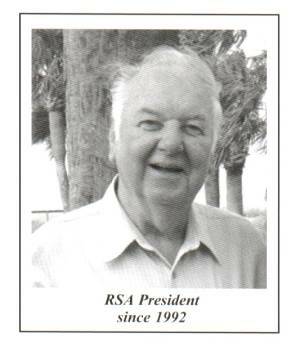 He objected to the NRA’s intention to do away with the Gun Collectors Leadership Seminar, volunteered for RSA to host the 2002 meeting and then put together the best conference the NRA ever had. I could go on and on extolling the benefits your Society has realized from having Roy Marcot as a member, Editor and Board Member. Then there are the Hubers. I thank both Jay and Hannelore since both were instrumental in chairing the Remington Society’s Seminars over the years. Beginning next year the RSA Seminar Coordinator will be Rich Shepler, who stepped forward in 2002 when the Hubers were not able to attend the Seminar in Ilion and did a bang-up job. He will certainly carry on the terrific seminars that we have come to know and love. Bob and Sue. Their raffles and silent auctions have turned out to be the hit of our RSA Seminars. Additionally Bob has taken over as our Society Treasurer, relieving John Gyde who guarded our purse strings for a number of years. Speaking of taking over a job, Gordon Fosburg has been our Secretary for lo these many years and when he announced he was stepping down, I began to search from someone to fill the large vacancy his retirement created. Once again, one of RSA’s Directors, Bob Hatfield, arose and said he would accept the challenge. Now there are others who have led the Remington Society to the exalted position it holds today, not the biggest, but the best arms collectors’ group in the country. I especially thank our Vice Presidents Jack Heath and George Slatten. Then there are the current and past members of the Board of Directors: Gene Myszkowski, Ed Hull, Lee Estabrook, Dolph McCleish, John Gyde, Rich Shepler, Gordon Fosburg and last bi~t certainly not least, Mike Strietbeck. tremendous effort put forth over the years by Mr RSA himself: Slim Kohler. Whenever there was work to be done, displays to be set up, documents to be copied, Presidents to be encouraged or articles to be in major arms collectors magazines, Slim was there! You didn’t have to ask him, you didn’t have to look for him, wherever the action was Slim was in the forefront, leading the attack. Without Slim your Society would probably not be around today. For sure there are others who have contributed a great deal: Fritz Baehr, our first President and the originator of the Remington Society; Gordon Stanley who steered the Society through four stormy years and did it with a smile. These two led the way and set the course for me to follow. To them I owe my profound thanks and gratitude. Last, but certainly not the least, I thank my wonderful wife, MaeBelle. With the patience uncommon in human experience, she abided my activities in the Remington Society for over 20 years, 12 of them as President. Without her support and forbearance it would not have been the fun experience it was. And so, I bid the office I have held for these many years a sad goodbye. Through thick and thin, lean times and fat times I have enjoyed serving every minute and I hope to enjoy the comradeship and friendships for many, many years to come. This, then, is my last LAST WORD! Fight the good fight, my friends!! !